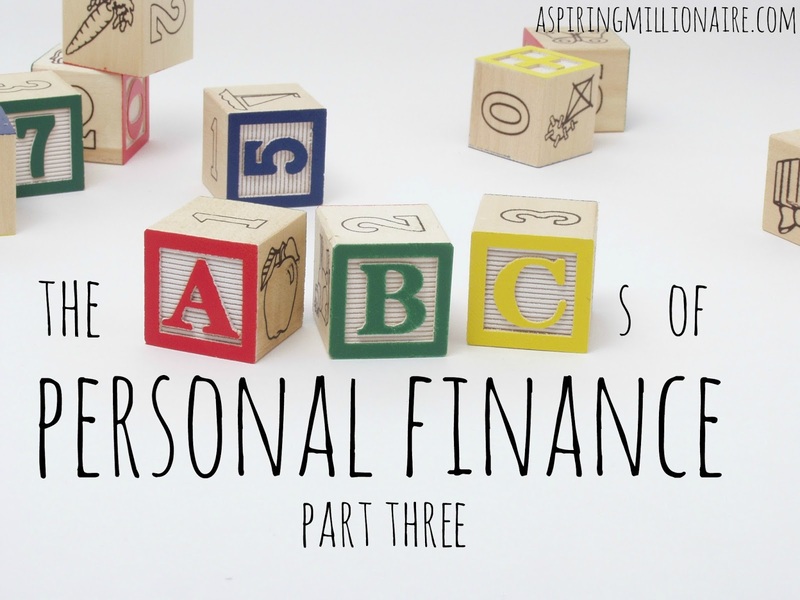 Welcome to the third and final installation of Personal Finance ABCs! If you've missed the past couple of weeks, check out Part 1 where we reviewed A-I, and Part 2 where we covered J-R. 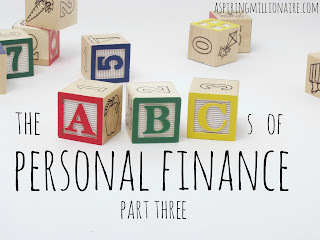 In Part 3, we'll be looking at the subsection of numerous, yet simple aspects of personal finance for letters S-Z. S is for Side Hustle- If you read a lot of personal finance blogs, there's no way you've missed the side hustle. Whatever you goal is, whether it's paying off debt, saving for a large purchase, or increasing your income in general, side hustling is a great way to get there. You can do almost anything for your side hustle, too. You can take surveys. You can walk dogs. You can get a traditional part-time job. You can even do something crazy like writing a personal finance blog. Side hustles usually work best long-term when you're playing to your own, unique talents and interests. Otherwise, it's easy to get burnt out. If your goal is short-term, most people find they can do almost anything for a small window of time. T is for Taxes- We all have to pay taxes. It's inevitable. But if you earn enough from your side hustle or are self-employed, keeping an eye on them is even more important. If you build enough income from either, you will be required to pay taxes quarterly, and if you are registered for GST, you will have to set aside money for that, as well. Not paying your taxes results in massive fines, so it's better to plan and pay than to get to the end of the tax year and realize you can't. U is for Unemployment- Unemployment is sometimes a part of life. It can derail our plans, send our finances into a tailspin, and make us feel generally hopeless. But there is hope. In Australia you can get unemployment benefits through Newstart if you are 22 years or older (with some exceptions for students and apprenticeships,) and get help finding a new job. While it's not the same as having a job, it's a ay to get back on your feet while enduring some temporary cutbacks. Vision Boards- Goals are more obtainable when we write them down, and more likely to be realized when we see them on a regular, daily basis. Creating a vision board (and a motivation wall in conjunction with it,) is a great way to do just that. Kylie is an expert at it, and you can check out her vision board tutorial here. W is for Workaholic- In your quest for a sound financial life, it can be easy to become obsessive. To worry about every last penny that you could possibly earn, and spend all of your time trying to make it. While it's good to be fiscally responsible, it's also important to live all parts of your life fully. Money is just the means; it's not the end. X is for Xtreme- What does Xtreme mean in personal finance? It means retiring in your 30s. It means paying off your mortgage ASAP, even if you just purchased the house. It means working at your side hustle so hard, that it becomes a full-time income, and you quit your job to pursue self-employment. Just like Xtreme sports, Xtreme personal finance isn't a bad thing. It's intense, and it can be quite the wild ride. But it's doable and possible if you've got the right personality for it. Y is for Yield- Yield is the return on your investment. This can be applied to actual, monetary investments, of course. But it can also be applied to work or time spent at something. Did the six hours you spent on a project yield enough of a return for you to be interested in doing it again? If you're not sure, divide the profit by six, and see if you're happy with what you made hourly. Z is for Zero-Interest Opportunities- This is a strategy that can be used when you're paying off debt. For instance, if you have a balance on a credit card that charges 24% interest, you'd be wise to look at opening up a credit card with an introductory 0% interest rate. (Usually these rates last for a set amount of months.) You typically have to pay a 3% fee to transfer your debt onto a 0% card, but that's much better than paying 24% month after month. Once you've transferred your money, you'll be able to attack the actual balance that much quicker. For particularly high balances, you may have to use this strategy again after the zero-interest promotion period expires to avoid getting hit with the higher rates again. Hope you enjoyed this series! Do you have any alternative suggestions for any of the letters? I'd love to hear them in the comments!